Polestar’s first ever electric car has made its public debut at Geneva. While the Polestar 1 was a sleek 600-hp hybrid coupe, its successor is the Swedish automaker’s first fully electric car. Following its online reveal last week, the Polestar 2 has made its public debut at the Geneva Auto Show, and it could pose the most significant threat to the Tesla Model 3 yet. Taking the form of a compact electric sedan, the Polestar 2 has discrete yet elegant styling, borrowing cues from Volvo’s design language such as the Thor's-Hammer-like headlights. It’s also based on Volvo’s CMA platform, which underpins models such as the XC40 compact SUV. A 78 kWh battery is integrated into the floor and powers a pair of electric motors, with one on each axle producing a combined output of 408 horsepower and 487 lb-ft of torque. This dual-motor setup allows the electric sedan to accelerate to 62 mph in less than five seconds. Official range details haven’t been released yet, but Polestar says it's targeting 275 miles under US-specific EPA testing. Unfortunately, this means the Polestar 2’s range falls short of the dual-motor Tesla Model 3, which has an EPA-estimated range of 310 miles. Charging times also haven’t been confirmed yet. Polestar will offer an optional performance package for the 2 that will improve the handling, which includes Ohlins dampers, Brembo brakes, and unique 20-inch forged aluminum wheels. Inside, the minimalist interior is devoid of animal materials and features Volvo’s new Google Android-based infotainment system for the first time with support for Google services such as Google Assistant, Google Maps, and the Google Play Store on the 11-inch touchscreen. In the US, the Polestar 2 Launch Edition starts at $63,000 for the first 12 months of production. With a $7,500 tax incentive, the price effectively comes down to $55,500. The non-Launch Edition will then be priced at $55,000, or $47,500 with the tax incentive. 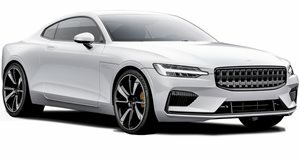 Preorders for the Polestar 2 are available online, with production slated to kick off in early 2020.